Poul Jørgensen on his Excelsior big port racer at Fanø beach speed trials in 1921. 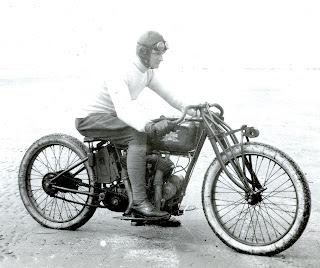 The Schwinn built Excelsior bigports where fast machines in their time making life pretty hard for Indian and Harley on the racetracks. I love those early machines where the controls are all mechanical, rods and ball joints. Just think about the labor cost on this compared to the later bowden cables. Imagine the roar of those exhaust pipes at full throttle along the track. Indeed Vincent, those guys where tough to the bone and one can just wonder how they afforded those racers as they where not cheap toys back in Yesterdaze neither. I seem to remember this bike won several of the races, need to double check that.